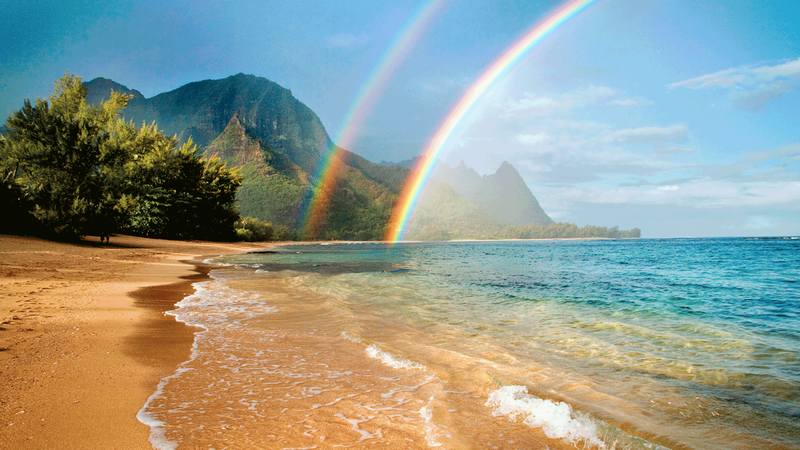 Hawaii is a perennial favorite travel destination, and for good reason! Pristine beaches, an array of activities like hiking and diving, and beach weather any time of year – all without needing a passport – make for a perfect vacation. You can get to Hawaii for nearly free with miles and points from the best airline credit cards. But what about hotels? Hawaii Is as Magical as Everyone Says It Is. And You Can Visit Using Points and Save $1,000s of Dollars on Your Next Vacation! 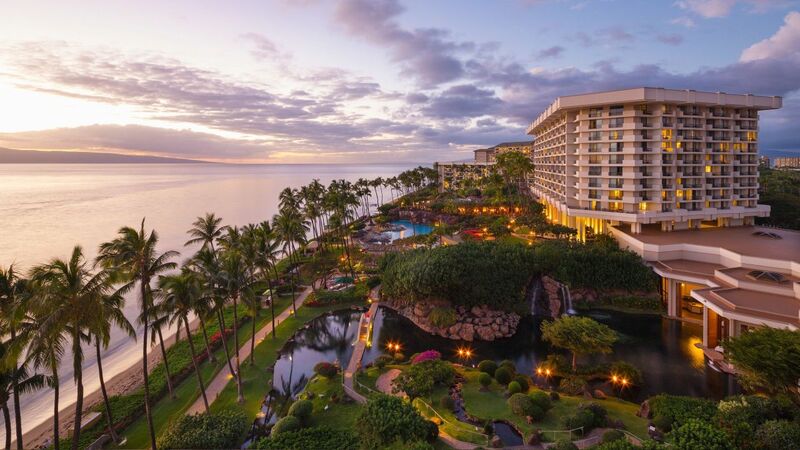 We’ve found 10 of the best hotels in Hawaii where you can stay for free with points! Looking for the Best Hotels in Hawaii That You Can Book FREE With Points? To make this list, we looked for hotels that are typically expensive with cash, and a great value with points. We only included well-reviewed hotels with at least a 4-star rating on TripAdvisor from actual guests who’ve stayed at the hotels. Million Mile Secrets team members have stayed at some of them, too! Hawaii is known for “resort fees.” And while Hilton and Hyatt do NOT charges these fees, Marriott does. There are 3 Marriott hotels on the list with daily resort fees – but you can use statement credits from certain cards to erase the charges and make your stay truly free! Plus, the deals were so good they were worth including here. Finally, we’ve included hotels all over Hawaii – not just in Honolulu! Although Waikiki Beach is world-famous for its surfing – and if you’ve never visited, you should totally spend a few days in Hawaii’s biggest city. With that in mind, here are 10 of the best hotels in Hawaii to stay at for free using points. The Grand Hyatt Kauai is the quintessential Hawaiian resort with white sand beaches, perfect pools, and 50+ acres of gardens – on the Garden Island, no less! Team Member Jasmin Loved Her Stay at the Grand Hyatt Kauai. And You Can Stay Here Completely Free With Hyatt Points! But these pretty rooms fetch a pretty penny – as much as $850 a night! But you can stay completely free with 25,000 Hyatt points a night instead. 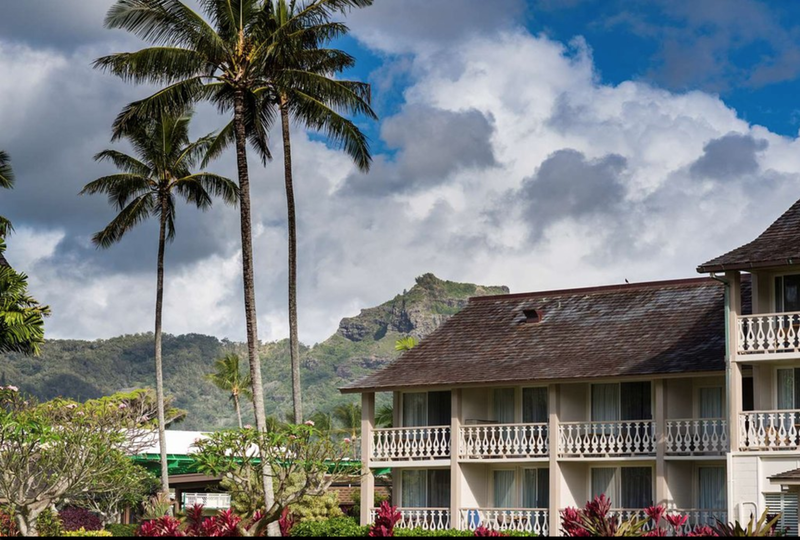 Kauai is one of the lesser-developed islands, so it really feels like you’re getting away when you stay here. The landscapes and oceanfront are stunning and wild. And 75% of travelers agree! It has an overwhelming number of 5-star reviews. Folks love the pools, grounds, and ambiance. You can collect Hyatt points for a free stay with The World of Hyatt Credit Card. Aston is a Hawaii-only chain hotel with locations across the islands. They tend to be well-located or slightly off the beaten path. I stayed at an Aston hotel in Kihei (on Maui) and loved walking to the town center past fresh fruit carts to enjoy a meal of fresh fish tacos and only one Mai Thai. OK, you caught me – I had 3 Mai Thais. But folks really do love the relaxing atmosphere, staff, and rooms at the Aston Islander on the Beach. Their prices tend to be cheaper than larger chains, and they have a boutique hotel feel, which can be a nice change. For example, I found rooms for $199 per night, plus taxes. This chain doesn’t have a points program, but you can use the Capital One Venture card to redeem your miles at a rate of 1 cent each for any hotel stay, including here. So you can stay in Hawaii completely free! Want to stay on the Big Island to explore Hilo, the coffee plantations around Kona, and amazing waterfalls just off the main highway? Of course you do! 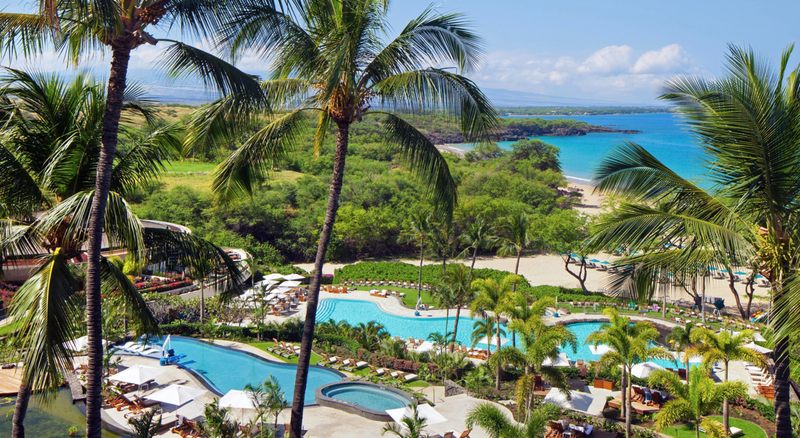 Do you want to pay nearly $500 a night to stay at The Westin Hapuna Beach Resort? Of course not! Guests rave about Hapuna Beach, the swimming pools, and staff. You can stay here for only 35,000 Marriott points per night, plus $30 per night for the resort fee, which includes access to a newly renovated fitness center and CrossFit studio. You can collect Marriott points for a stay with the Marriott Rewards Premier Plus card. Then use another card, like the Capital One Venture Rewards Credit Card to cover resort fees. We think it’s worth paying the small price to save ~$1,000 on a 2-night stay! 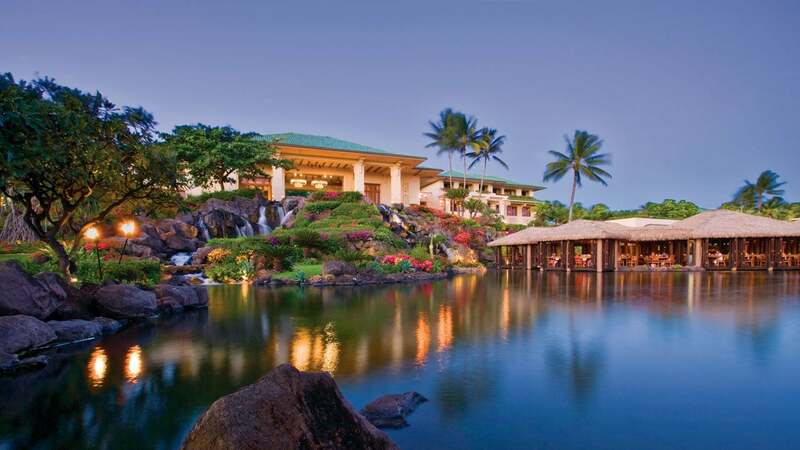 Next, we venture to Maui and the Hyatt Regency Maui Resort and Spa. Folks love having 40+ acres on renowned Ka’anapali Beach, and more than half the guests leave 5-star reviews about their stay here. The hotel is a short walk to Lahaina town center. And you’ll have plenty of beachfront and pools for relaxing in the Hawaiian sun. Rooms here can go for ~$450 a night, or you could pay 20,000 Hyatt points for each night. The Ink Business Preferred℠ Credit Card is a great card for free nights at this gorgeous hotel. Remember, you can transfer the Chase Ultimate Rewards points you earn with this card directly to Hyatt at a 1:1 ratio, and use them for your award stay. Myself and team member Jasmin stayed at the Hilton Hawaiian Village Waikiki Beach Resort. I loved the multiple swimming pools, oceanfront, and how easy it is to walk to Waikiki Beach and spots in Honolulu. The grounds are sprawling, and there are plenty of shops and restaurants to keep you entertained. Guests say it’s the perfect place to spend a few days and have everything you need nearby. Rooms here vary from $200 to $400+ per night, depending on the season and occupancy level. And most award nights are open for ~60,000 Hilton points. You can quickly earn Hilton points with the Hilton Honors American Express Ascend card. 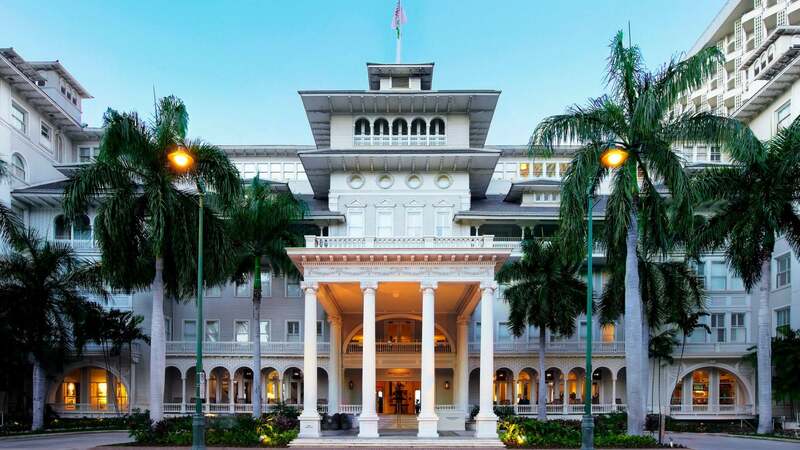 If you want a pristine hotel right in front of Waikiki Beach, consider the Moana Surfrider, A Westin Resort & Spa, Waikiki Beach. People who stay here love the location, rooms, and old-world charm. Team member Jasmin stayed here with her family and has memories of dining under a banyan tree in the courtyard. She liked that you could easily walk to lots of places in Honolulu. While there’s a $38 per night resort fee, rooms here typically go for $400+ a night. And you can use 60,000 Marriott points to cover the room rate. Points earned with the Marriott Rewards Premier Plus can cover the lion’s share of your stay. And other cards can erase the resort charge to make your stay free! 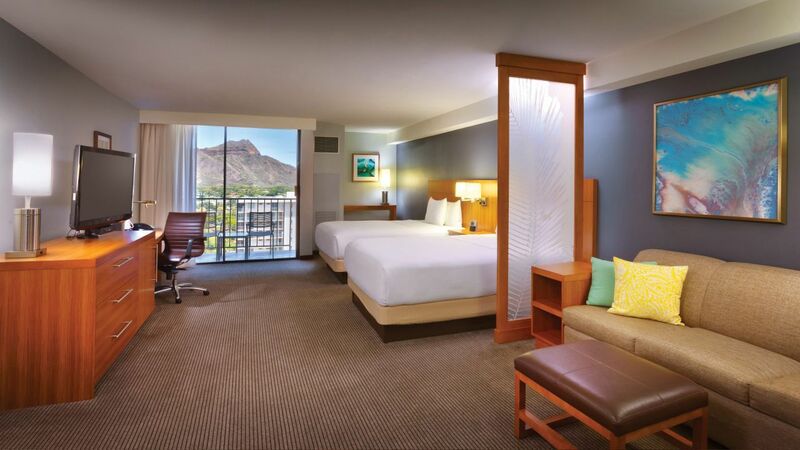 If you prefer a Hilton hotel that isn’t a huge resort, consider Hilton Waikiki Beach. It’s only 1 block from the beach, and folks like having easier access to sites in Honolulu, like Diamond Head, Honolulu Zoo, and dining options downtown. I found rooms going for ~$280 per night in January 2019. Or, you can use 50,000 Hilton points per night. The Hilton Honors American Express Business Card can help you earn free nights here. And because it comes with elite status, you’ll get free breakfast, too! Back to Kauai, and the Kaua’i Marriott Resort in Lihue! This is a proper Hawaiian-style resort, with sprawling pools, beach access, gardens, 5 restaurants, and an on-site fitness center. Folks ranked it the #3 hotel in town, and like the free shuttle to the airport (which is only minutes away), the jacuzzi, and huge family pool. I found nights here in January 2019 going for ~$475 per night. Or, you can use 40,000 Marriott points and pay the $35 per night resort fee, which is a much better deal. If you’re driving around the Big Island and want a great place to stop and explore, Kona has cute restaurants, shopping, and activities. I took a tour of a coffee plantation and enjoyed walking around downtown Kona. 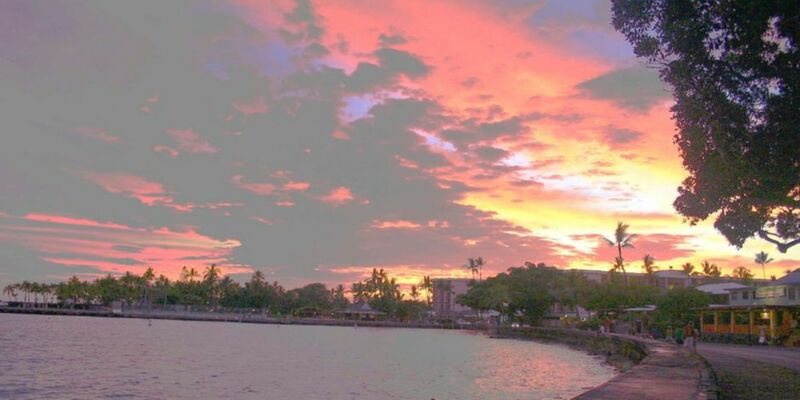 The Holiday Inn Express & Suites Kailua-Kona is walking distance to plenty of spots downtown. And the location and spacious rooms earn it nearly 5 stars on TripAdvisor. Rooms here are ~$250 a night over Valentine’s Weekend in 2019. Wouldn’t it be nice to take your honey here? You can pay with 40,000 IHG points a night and save a bundle. The IHG® Rewards Club Premier card is a great way to start collecting points for your getaway. 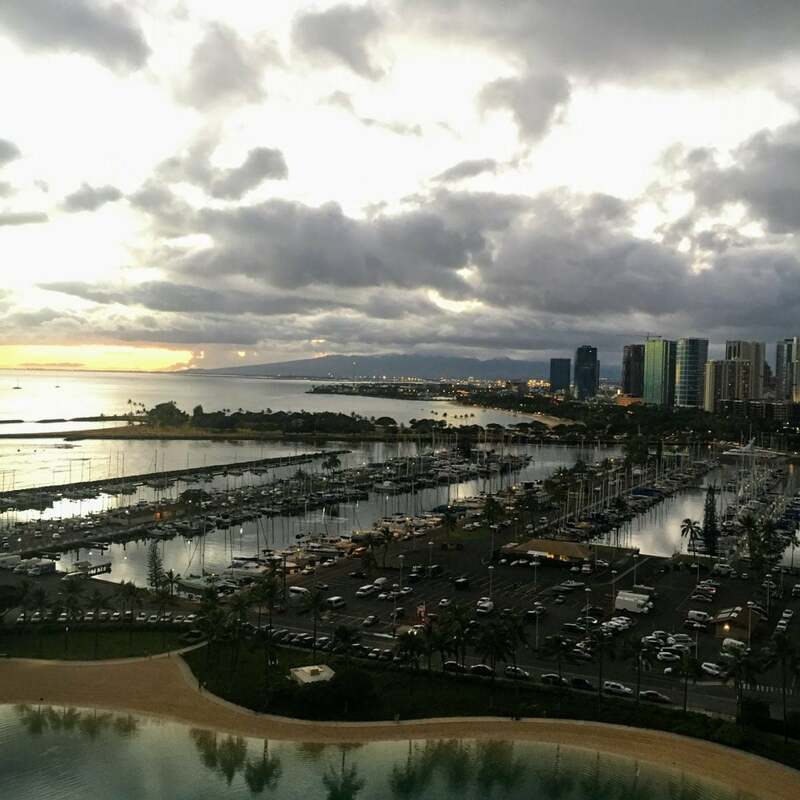 The Hyatt Place Waikiki Beach deserves a spot on the list because it’s a fantastic value with Hyatt points – you only need 12,000 points per night to stay. Room rates are sometimes cheap enough that you can do well to save your points and take a statement credit instead. I found rooms for ~$259 a night in February 2019. Plus, folks really like the staff, location, and rooms here. Points earned with the Citi Premier Card are worth 1.25 cents each toward travel, which would cover free nights here if you find a cheap room rate. And you can always use Hyatt points earned with The World of Hyatt Credit Card when paid rates are high. Either way, your out-of-pocket cost can be a sweet $0! A trip to Hawaii is within reach when you use points to stay at one of these top-rated hotels for free! All of these hotels have fantastic locations, places to swim, amenities for families, and did we mention they’re in Hawaii? 😉 They also get great reviews from real guests. So which one is best comes down to which island you prefer and which loyalty program best fits your travel needs. Whatever you decide, it’s possible to get a completely free stay in Hawaii, even if you have to deal with resort fees, because lots of cards offer statement credits for travel expenses! Have you stayed free in Hawaii with points? What’s your favorite hotel on the list?